Glacé cherries and candied angelica decorated every cake and gateaux in the 60s; it is very hard to find candied Angelica now so use jelly sweets or cake decorations instead. 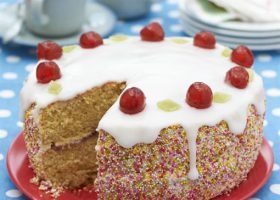 Baked on a Victoria sponge cake, you can guarantee everyone will want a slice of this retro cake at your party. Heat the oven to 180°C, 160°C fan, gas 4. Grease and Line 2x 20cm (8in) round sponge tins with baking parchment. Place the butter and sugar in a mixing bowl and beat with a wooden spoon or electric mixer until light and creamy; it should be pale in colour. Gradually beat in the eggs a little at a time until smooth, adding a little flour if the mixture curdles. Divide the mixture between the cake tins and bake for 25 –30 minutes until golden brown and just firm to the touch. Allow to cool on a wire rack then remove the paper. To make the butter cream place the butter in a bowl with 1-2 tsp boiling water, add the icing sugar and beat until smooth. When the cake is cooled, remove the paper and place on cake on a serving plate, flat side upwards, Spread with the jam and a little of the butter cream. Place the other cake on top. Spread the remaining butter cream all around the side of the cake. Place the sugar sprinkles on a plate or shallow bowl, then pick up the cake and roll the sides of the cake in the sprinkles. Place on a serving plate. Mix the fondant icing sugar with just enough water to make a thick icing that just pours. Spread it over the top of the cake to completely cover it, then decorate with cherries and jelly sweets. This cake will keep in a cake tin for up to 1 week.